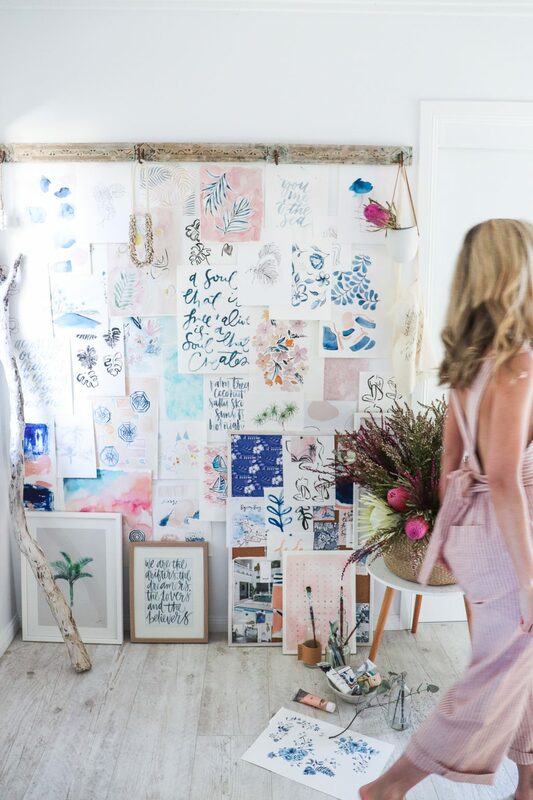 Step inside the home studio of the Sunshine Coast based designer and hand-letter and watercolour artist Cass Deller. Cass Deller describes her style as coastal, fun and feminine – which is exactly the vibe both her design work and her studio emanate in a highly covetable way. Let’s take a look! I first met Cass at a business retreat in the Byron Bay hinterland 18 months ago now. I had already been told by our mutual friend that she thought I’d love Cass – and she wasn’t wrong! It’s hard not to be drawn to Cass’s warm, positive and uplifting energy. She’s crazily modest and uber talented. 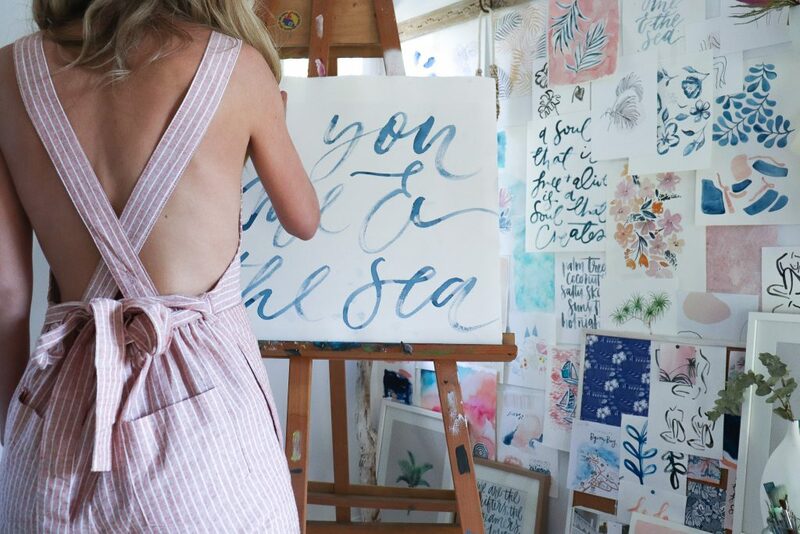 As an in-demand and often booked out designer under her business Cass Deller Design, Cass uses watercolours and hand-lettering techniques for designing products, brands, textiles and surfaces. 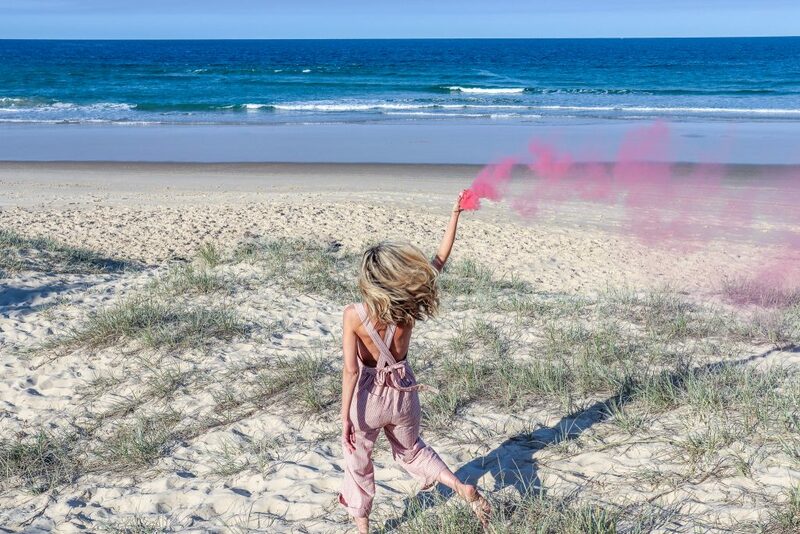 With a portfolio filled with bespoke designs for brands including Provincial Living, Blushing Confetti, Kulani Kunis, Organic Nights, Citizens of the Sun and The Dairy, last year saw Cass venture into a new medium. 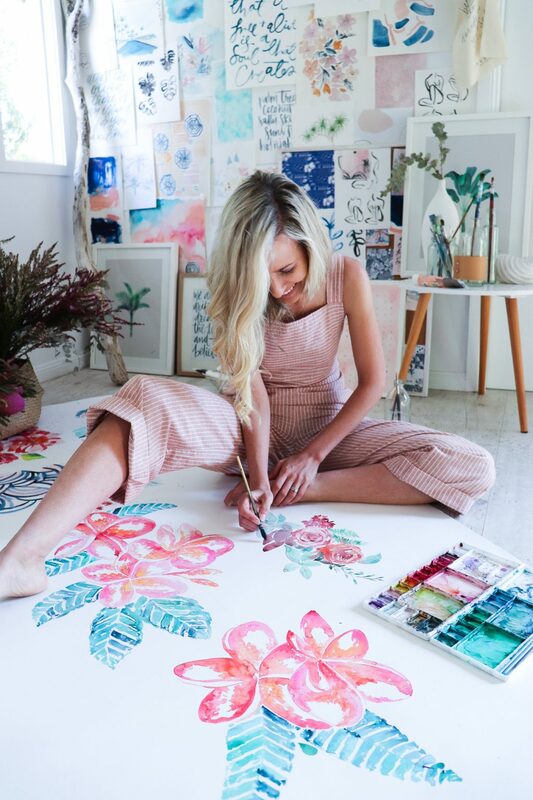 After collaborating with Gold Coast based Donna Guyler Design to create her first ever mural in a Broadbeach home (check it out here), come January 2019 and Cass is already booked out with mural creations for the year ahead. Let’s call that the Cass Deller magic ;). 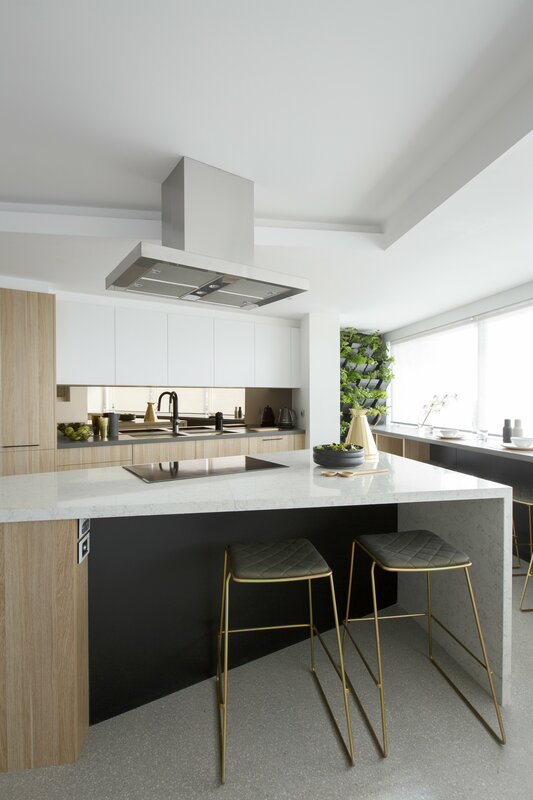 Cass’s distinctive style carries through to her approach to interiors – a little boho, a lot beachy and always effortlessly cool. So meet the inspiring Cass Deller and take a peek inside the place she calls home. Cass, tell us about the story behind where you now live? 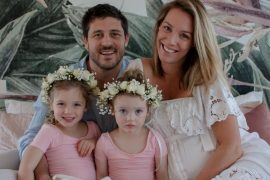 We are originally from Brisbane, and moved up to the Sunshine Coast 5 years ago. My husband and I had just married, left our corporate jobs, and both started our own businesses from home (Emily here! Check out Brent Deller’s coffee roaster, barista training hub and cafe First Batch Coffee), within a month of each other. After a month or so of working from home, we came to the realisation that we could be doing this from anywhere. It was then that we decided we’d pack up everything and move to the coast. Six months later we found a rental and started to settle in. We bought the house we are in about two years ago after we needed a bigger home, and we wanted to be walking distance to the beach. We were also looking for a home that could house my design studio, and we found just that. 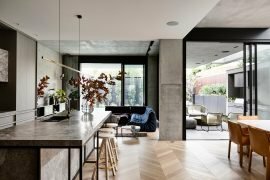 What have you done to the home since moving in? As soon as we moved in, the studio was the focus!! 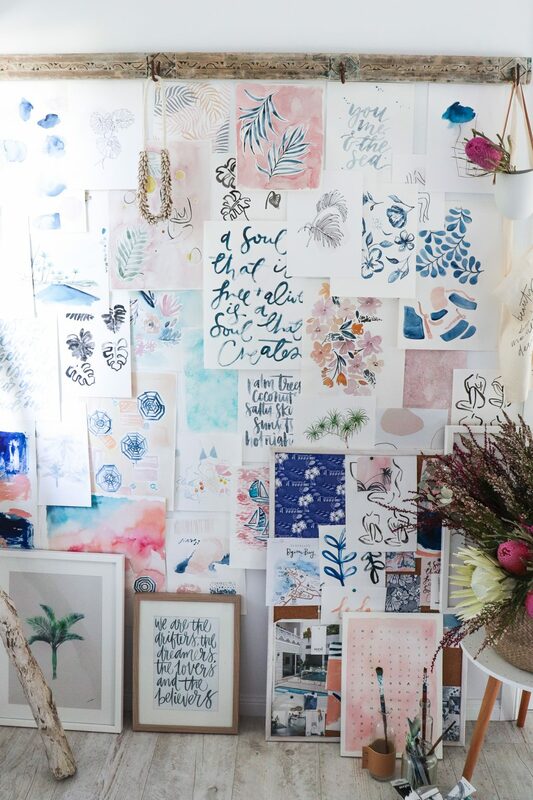 As a creative work space, I was so passionate about making the space as dreamy and inspiring as I could. I wanted to look forward to coming downstairs to work, and so we completely renovated the living space downstairs. The existing décor and paint made the downstairs room very dark so we immediately painted all the walls white, had new floors laid and new windows installed for more natural light. I absolutely love it! Upstairs had some dark features too, however more natural light does filter in from the large back deck. We also gave the house a fresh coast of white paint, and even painted a beautiful section of timber ceiling white. It’s probably my favourite feature of the house. We love our home to feel comfortable, and to be a reflection of us. We are quite minimal, despite the hundreds of kids toys we seem to acquire each year. With a toddler and baby on the way we like to keep things paired back and simple. I love your style! How would you describe it – and does this seem to change over time? I would describe my style as coastal, fun and feminine. Where do you love to source homewares from? 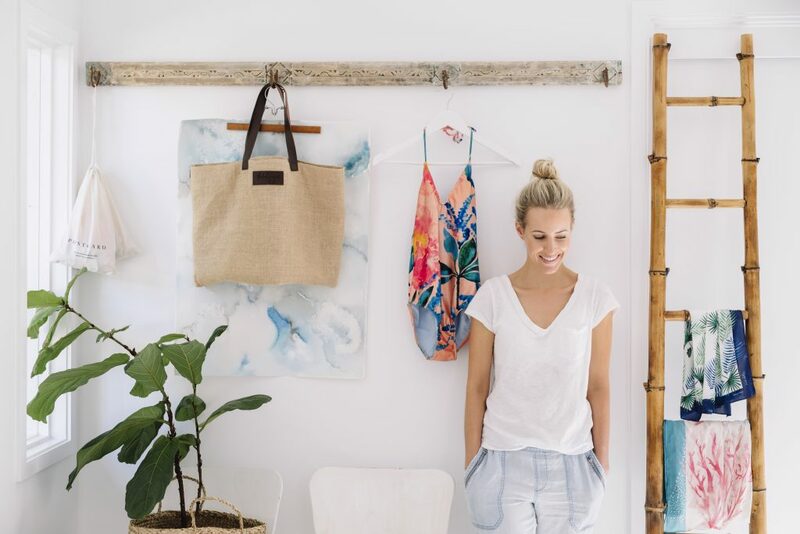 My girlfriend has a beautiful store on the Sunshine Coast called Hello Trader which is now definitely a fave for homewares. To be honest, I actually don’t buy a lot of homewares for myself. Most of our beautiful homewares have been gifts from over the years, or items picked up on our travels. I treasure them so much more when they have that extra meaning behind them. What is an investment purchase you have made? Or how about some great bargains you have found? If you know me well you know I love a bargain! Haha. But we do have a few investment pieces we’ve purchased too. We bought a gorgeous big rattan pendant light which features above our dining table, with a white VJ ceiling as a backdrop, it’s simply stunning. We also invested in a beautiful leather lounge a few years ago, which has been the best kind of couch to wipe over with toddlers around. Working from home, how did you create a space you’re productive in? For me it’s about making the space as inspiring as possible. I display my work in my studio as well as physical moodboards that inspire me. If I don’t LOVE the space I work in, I just can’t find my flow and find it harder to be creative. If the space doesn’t reflect me and my creative business, I find it hard to see my vision of the brand and where I want it to go. How long have you had your business and how has it changed over time? My business will be 6 years young this March. It’s changed SO SO SO much over time. I started off designing wedding stationery, and finally gave that up last September. 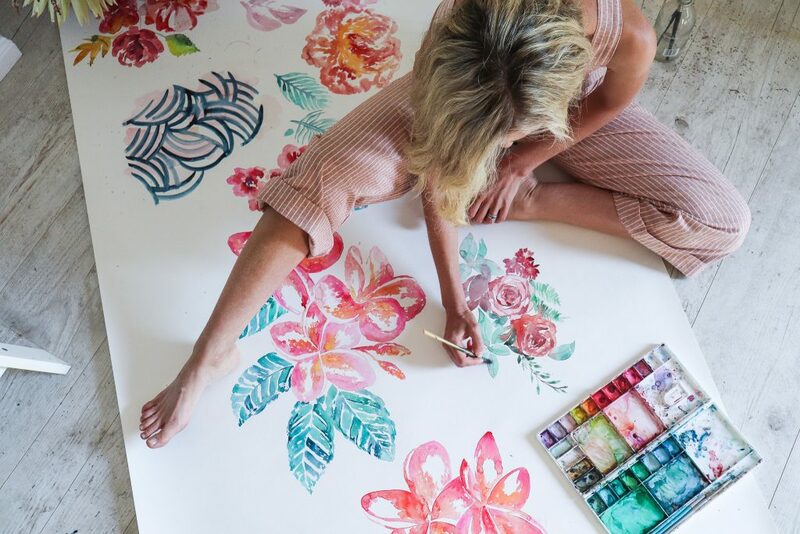 I’ve been fortunate enough that I’ve been able to pivot a lot in my business and now we have a large focus on custom illustration, textile design, surface design and logos. I’ve also had our first child in that time, so I’ve made my work flexible enough to fit in with me and my lifestyle. What has been most challenging about running your own business? By far the most challenging part is running a business and having a baby at the same time. As my business is service focused, it’s very time consuming which can have a strain on a young family. In saying that having my own business has also allowed me to start and finish when I need to and take days off where required, so in that sense it’s been great. What has been a great lesson you have learnt? To find time for my own creativity, outside my clients briefs. 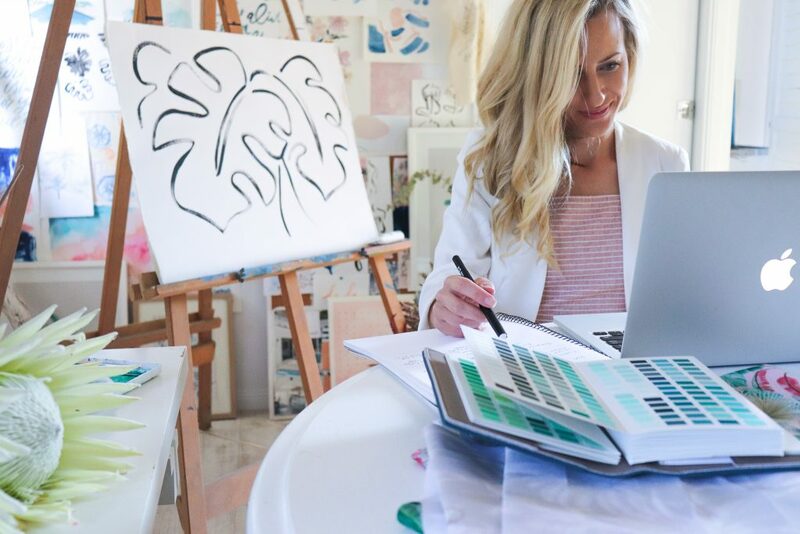 As many creatives would know, when you turn your hobby into a passion it can become draining as you are all of a sudden working to briefs, and deadlines as well as thinking of the financial impact. I learnt a couple of years ago to always have a passion project on the side, or just find time for more fun and play to let those creative juices flow and avoid burnout. What marketing has worked the best for you for growing your business? Instagram has been my number one marketing tool. It’s my portfolio and website all in one. 99% of my inquiries come through Instagram. How would you describe your strategy for Instagram? What do you focus on? Initially when I first started Instagram I didn’t really have a strategy, I didn’t really even know what I was doing. I would just post images of my work that I was doing and it naturally started gaining interest. Over the first couple of years I just saw organic growth without any real strategy other than sharing the design work and illustrations that I was creating for my clients. In recent months though I’ve seen a big shift on Instagram and I am trying to join that movement. Instagram is not so much about likes or follows for me anymore, it’s about engaging with my audience. I am trying (with a capital T) to be more vulnerable and share more BTS with my followers so that they see a glimpse into my personal life and into the work that happens in my studio. I also love to inspire young illustrators and designers to follow their own creative journey and be an example that you CAN have a successful design business, raise and family and live a beautiful life. Finally, can you name drop a woman who has a chic Aussie home for us to stalk?! 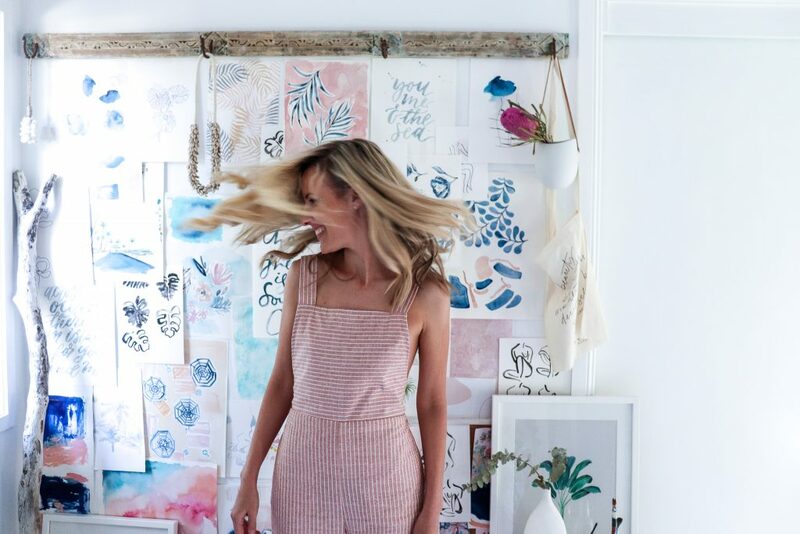 Nic from She Creates – she’s so creative and is a style master! 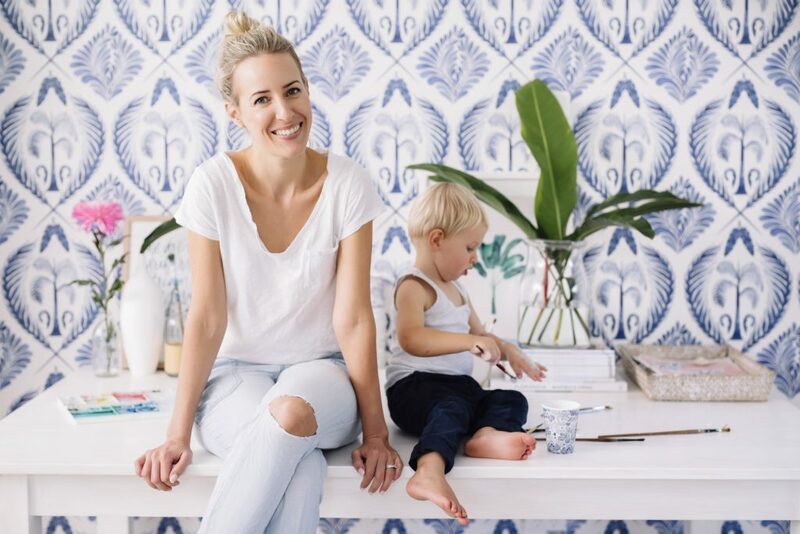 Simone Barter from Style Life Home. Gorgeous coastal style and impeccable taste! Melissa Ambrosini – stunning new renovated beach home in Noosa! 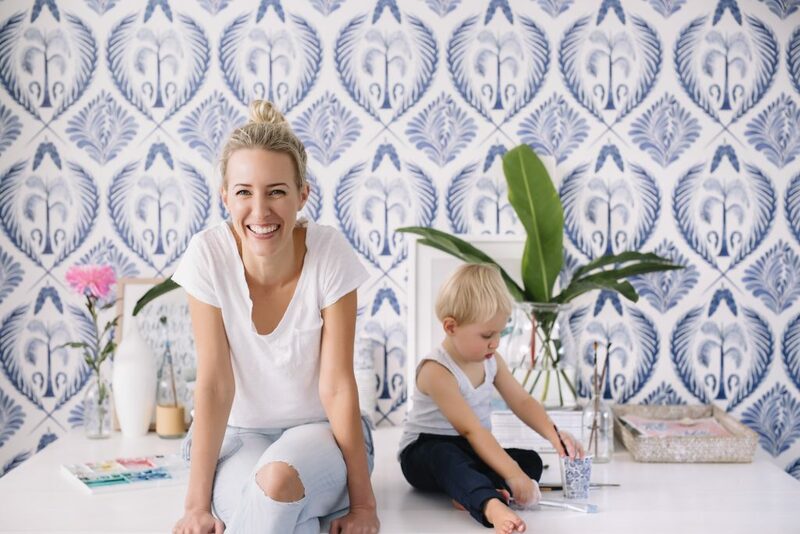 Sarah Jane Young from She is Sarah Jane – oh my, her home is next level. A huge thank you to Cass for sharing her story and home with us. 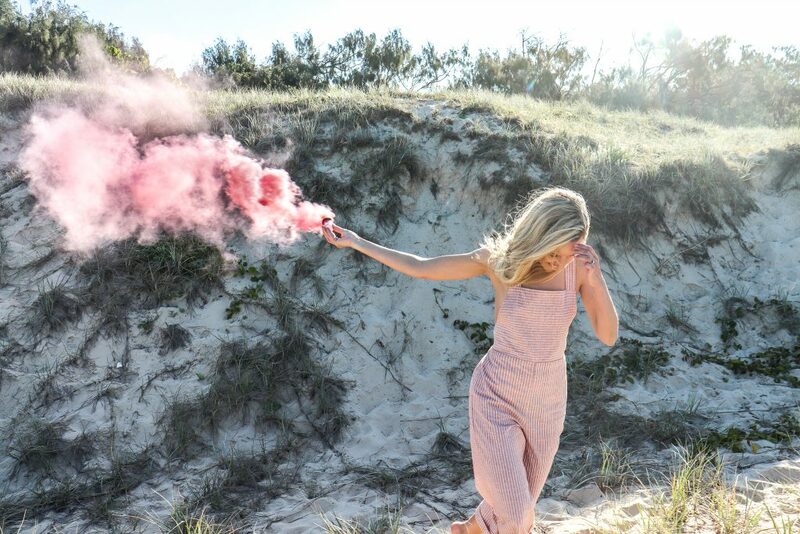 Visit cassdeller.com.au and follow @cassdeller on Instagram.